Ogre’s Eyes in Swamp sauce from Kirkintilloch’s Pauls Quality Butchers in Scotland were the winners of the Halloween awards. The awards were set up to stimulate butchers into making products with a Halloween and Bonfire Night theme. Craft butchers were challenged to get their thinking caps on and create something that would capture their customers’ imagination. Scott Brothers in Dundee made the Catherine Wheels – sausages on sticks – that were the best Bonfire Night product and Ogre’s Eyes in Swamp Sauce by Pauls Quality Butchers, Kirkintilloch were the best product in the Halloween category. For these award winners their tricks proved to be a real treat when it came before the judges at the product evaluation event at Dunfermline Athletic Football Club. Their products were chosen from over 80 entries in each of their categories as the most tasty and promotable. 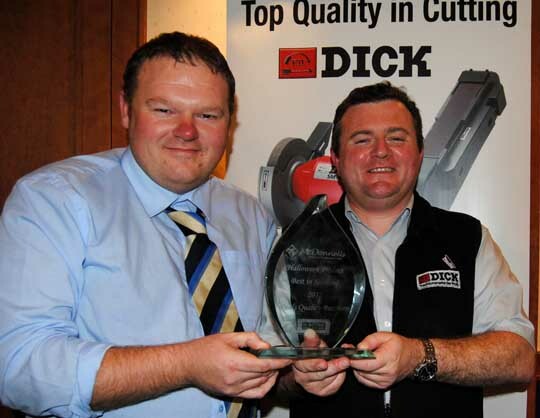 Paul Conway receiving his Diamond Award for the best Halloween product from John Gallagher of sponsors McDonnells. The products were photographed by Eddie Phillips at Abertay University with the valuable help of local food stylist Maxine Clark. Promotional posters were then made using these images and the posters and the recipe for these products has been circulated to all Scottish Craft butchers so that they can be promoted by butchers throughout the country. Note: For those who might be concerned – Ogre’s Eyes are made from pork and has cheese worked into the product, finished with a stuffed olive. Ogre’s Eyes With Swamp Sauce, Pauls Quality Butcher, Kirkintilloch. Spooky Spicy Schnitzel, A D Paton, Largs; Wee Witches Cauldron, Charles Duncan the Quality Butcher, Troon; Chick or Treat, Henderson of Hamilton; The Witches Cauldron, Henderson of Hamilton; Toffee Apple Pork Burger, J C Douglas Quality Butcher, St Boswells. Witches Cauldron Cheese & Garlic Truffles, Bert Fowlie, Strichen; Witches Brew, D H Robertson, Arbroath; Scary Spiced Tomato and Red Onion Pork Sausages, David Faulds & Son, Kilmarnock; Hell Fire Burger, Hopetoun Farm Shop; Witches Fingers, Hopetoun Farm Shop; Spicy Pork & Pumpkin Cauldron, James Pirie & Son, Newtyle; Witches Cauldron, Scott Brothers, Dundee; Toffee Apple Sausage, D H Robertson, Arbroath; Witches Fingers, Pauls Quality Butcher, Kilsyth; Flame Steak, S Collins & Son, Muirhead; Whizz Ring, S Collins & Son, Muirhead. Catherine Wheel, Scott Brothers, Dundee. Katherine Wheel, Alex Mitchell Butchers, Glenrothes; Spicy Lamb Sparklers, James Pirie & Son, Newtyle; Fire Cracker Sizzler, Henderson of Hamilton; GB Banger, Henderson of Hamilton; Wheels of Fire, Charles Duncan the Quality Butcher, Troon; Gunpowder Beef Truffle, S Collins & Son, Muirhead; Gunpowder Plot Burger, John Lawson Butchers & Delicatessen, Uphall. Bonfire Stir Fry, A D Paton, Largs; Guy Fawkes Gunpowder Steak Pie, Boghall Butchers; Pork Whizz, Charles Duncan the Quality Butcher, Troon; Firecracker Splits, D G Lindsay & Son, Perth; Guy’s Explosive Meat Balls, David Faulds & Son, Kilmarnock; Pork & Caramelised Red Onion Katherine Wheels, James Pirie & Son, Newtyle; Bonfire Chicken Parcels, John Lawson Butchers & Delicatessen, Uphall; Whizz Chunkie Steak Burger, R George, Lhanbryde; Crackle Caramelised Onion & Black Pepper, R George, Lhanbryde; Fire Cracker Rockets, Scott Brothers, Dundee; Piri Piri Catherine Wheels, W F Stark, Buckhaven; Beef, Cheese & Onion Rocket Launchers, W F Stark, Buckhaven; Saltire Cracker, S Collins & Son, Muirhead.